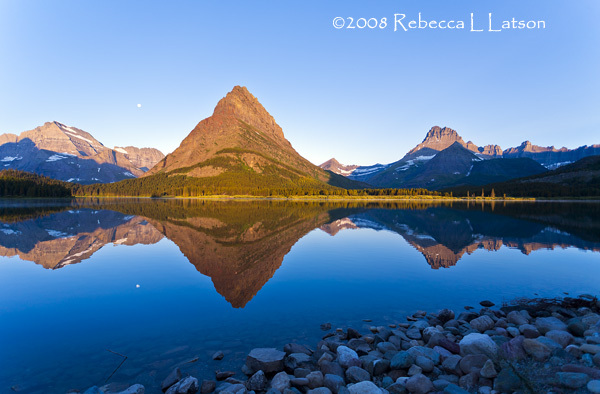 In 2008 and 2009, I traveled from Texas (where I currently live) back to Glacier National Park, Montana. I’m a Montana native, having been born some 20 miles from the park. 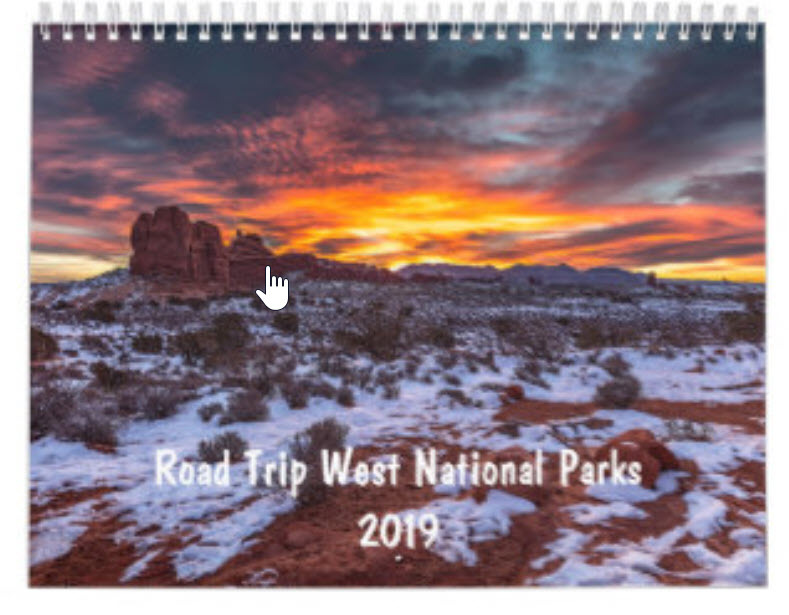 Something I’d always wanted to do but never had the time (after moving away) and could never really afford (until my job in Texas) was to stay at each of the lodges within the park. 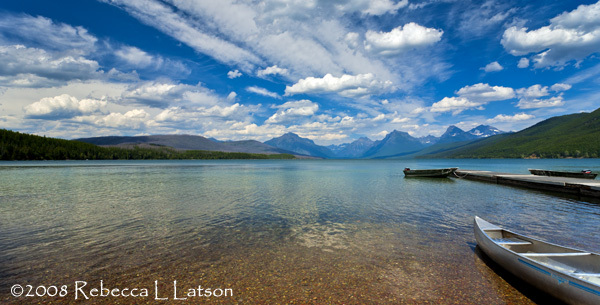 I had not returned to Glacier NP for about 10 years and it was time for me to once again breathe in not the chlorox fumes or gas flare that I normally inhale on the way to work in the mornings, but rather the cool, crisp, pine-saturated air of the park’s mountains. 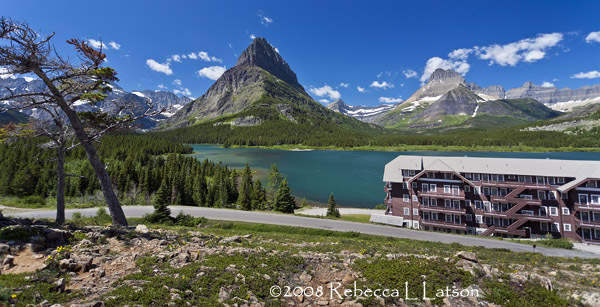 While I will be adding future posts regarding my Glacier National Park photo trips, what follows here is a description with photos of the lodges in which I stayed over the course of those visits in ’08 and ’09. 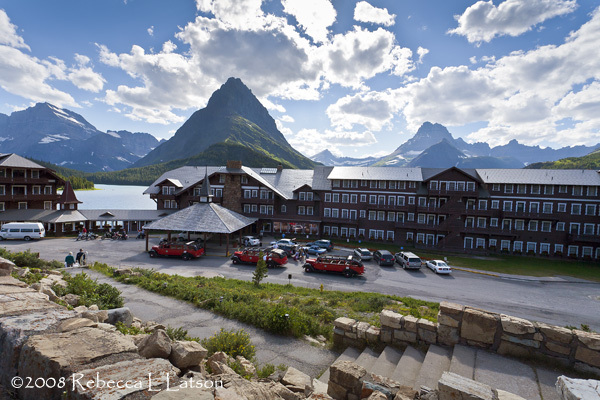 The National Park Reservations site http://www.nationalparkreservations.com/glacier.php?gclid=CJHkvuuwkqsCFec65QodfTivwg lists quite a few lodging options within and outside of the park. 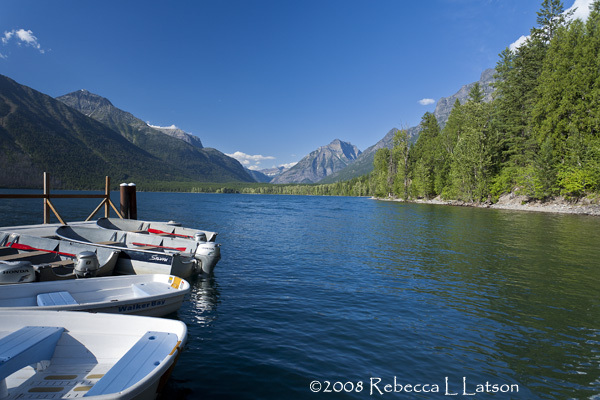 The lodges to which I refer in my post title are the lodges I remember seeing and hearing about while living in Columbia Falls: Village Inn at Apgar (not exactly what I would consider a rustic lodge, but still within the park boundary), Lake McDonald Lodge, Rising Sun Motor Hotel (a little more “rustic” than Apgar), Many Glacier Hotel, Swiftcurrent Inn, and Glacier Park Lodge (aka The Great Northern Hotel). It is those lodges to which I returned during my visits to the park. The very first place in which I overnighted within the park was the Village Inn at Apgar, which is accessed via the West Glacier entrance (or, via Going-To-The-Sun Road from the eastern part of the park heading toward the west entrance). West Glacier is about 20 miles away from Columbia Falls. 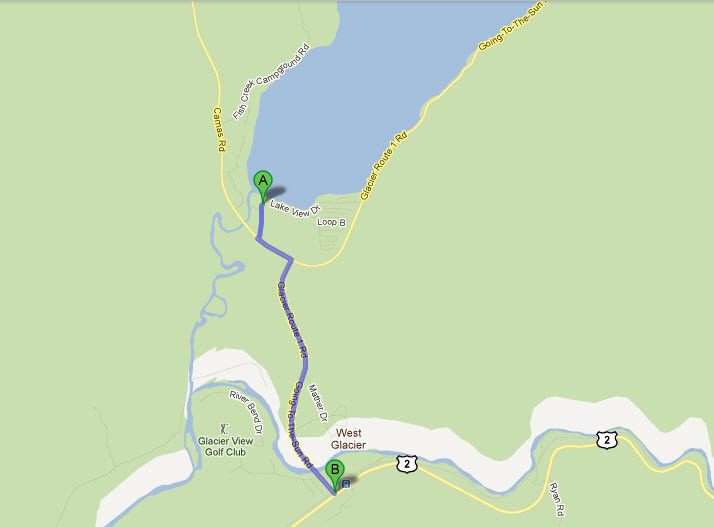 Apgar is located approximately 2.5 miles inside the west entrance to the park. I’m afraid I don’t have any photos of my room for that night – sometimes I remembered to photograph my lodging and sometimes I forgot. 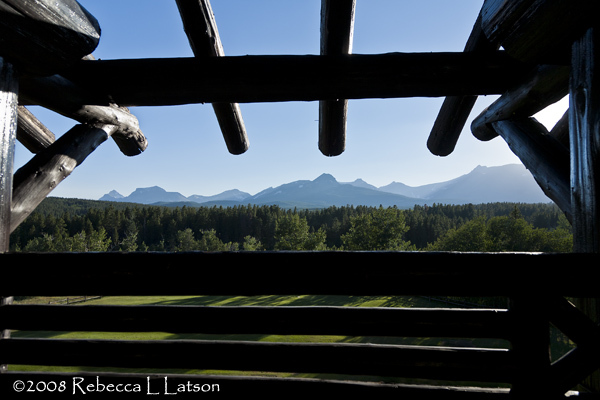 Since 2008 was my first time back to the park in 10 years, I guess my excitement to get out and photograph the mountains eclipsed my self-appointed duty as a room reviewer to capture the interior of that night’s stay. I vaguely remember there being a screen door, and the bed was comfortable and the room was clean. I’m not too terribly picky about my rooms, except that I do expect them to be clean. I don’t require a television, which is a good thing, since the rooms I stayed at in the park were not equipped with TVs or air conditioners (AC? In the Montana mountains??) or radios or even WiFi (come to think of it, though, there might actually have been WiFi in some of those places – I just never gave it much thought as I was perfectly happy to be away from the world wide web and could always tether my Blackberry to the computer whenever I found cell service – which is slim to none out there in the mountains). 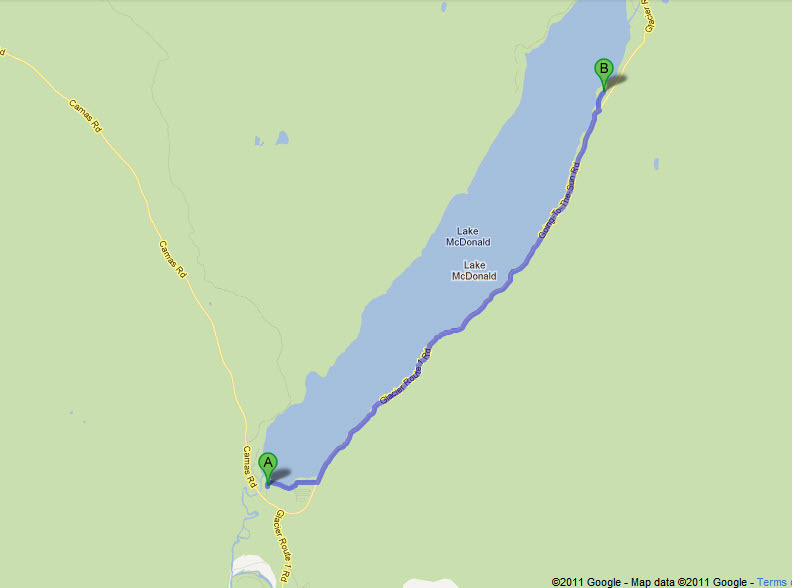 There’s a little restaurant as well as a cafe and snack shop along the road next to the lodging, so I ate my dinner and breakfast there before heading on to Lake McDonald Lodge, a few miles further up Going-To-The-Sun (GTTS) Road. I really wanted to stay in the main lodge, but nothing was available, so I spent the night in one of their “cabin-ettes” (my term) – one of a number of small cabins near the main lodge, which have been divided into two separate units, each with their own entrances and parking areas. Furnishings in my unit consisted of a queen-sized bed, a desk, nightstand, two chairs, a heater, lamps, and a bathroom with an extremely small (can you say “closet-sized”?) shower. It was clean and comfortable (really my only two pre-requisites for a decent room) and I didn’t stay much in the room anyway. 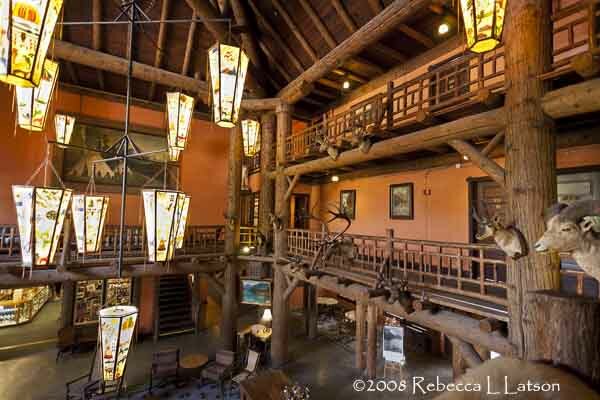 I naturally did not get a photo of that room either, although I proceeded to capture a gazillion shots of the main lodge lobby. Oh, before I forget: if you stay at any of the lodges within the park, make sure you bring along a 3-prong-to-2-prong outlet adapter. Some rooms in the lodges have 3-prong outlets, but the majority of the rooms have only 2-prong outlets, thus making it a bit difficult to plug in a laptop or any other electrical appliance with a 3-prong cord. I was clueless about this, though, until I wanted to plug in my laptop. 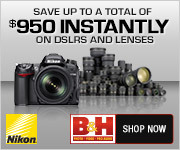 So just remember to visit your local hardware store (Lowe’s, Home Depot) or discount store (i.e. Wal-Mart, Fred Myer, Target) to purchase one of these adapters. 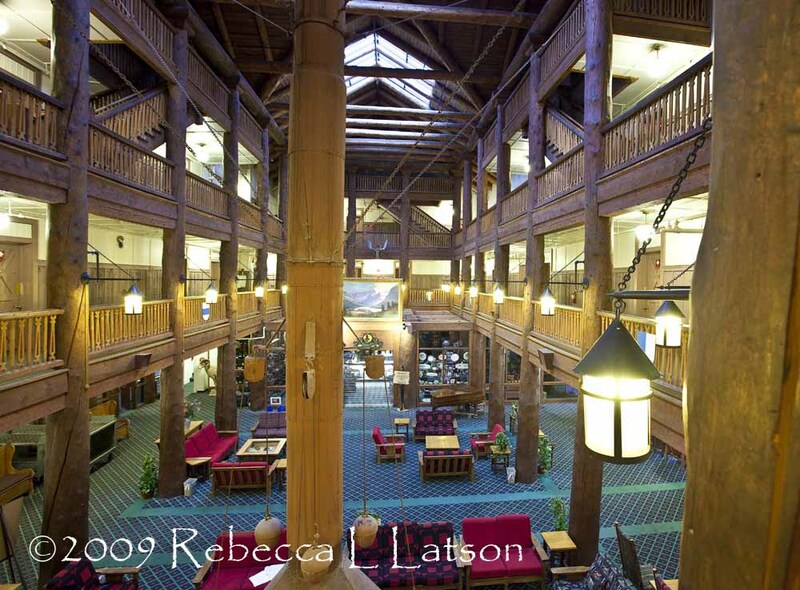 At Lake McDonald lodge, one of my first tasks after dropping all my luggage onto the bed was to grab the cameras and tripod and march into the lobby for some interior photos. 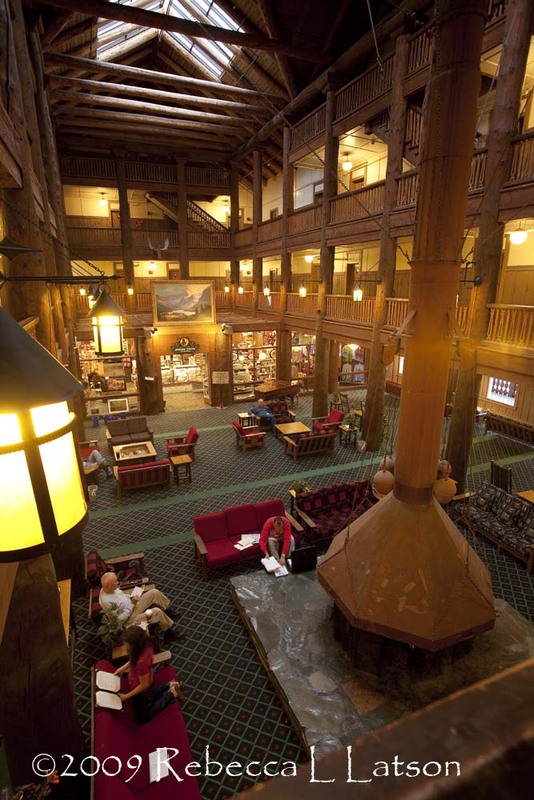 I think the Lake McDonald Lodge lobby is my favorite of all the lodges (the Glacier Park Lobby comes in a close second – though it’s cavernous size makes it not as warm and inviting). Those painted chandeliers you see were once made from buffalo hide. Time and the effects of the light bulbs damaged the original hides, so graphic artists were called in to hand-paint the original designs onto a sturdier type of material for a longer-lasting light fixture. After photographing the lobby, I marched back outside and down a path the short distance to the waterfront to snap a few photos of the view from the lodge shore. From the boat dock in the photo above, I hiked back up the short trail to the lodge entrance to find a parked Red Jammer. 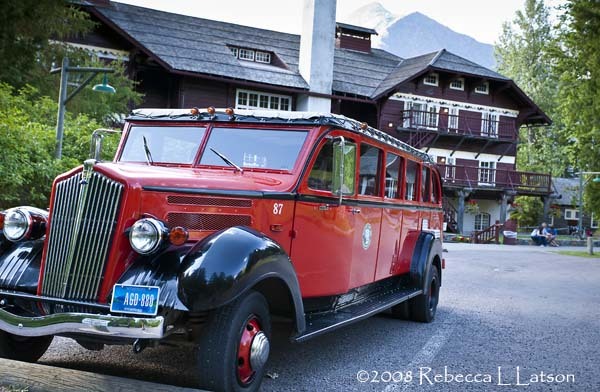 Red Jammer buses are these wonderful historic tour buses http://www.glacierparkinc.com/tour_detail.php?id=1 which are an iconic part of the park, offering a number of different tours along GTTS Road. 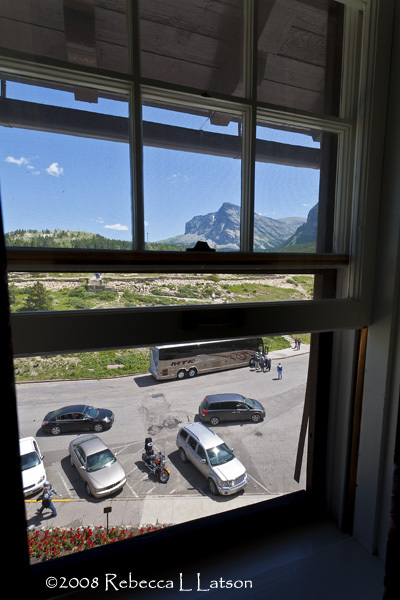 The roof of the bus even rolls back for riders to enjoy the fresh mountain air during clear, sunny days. 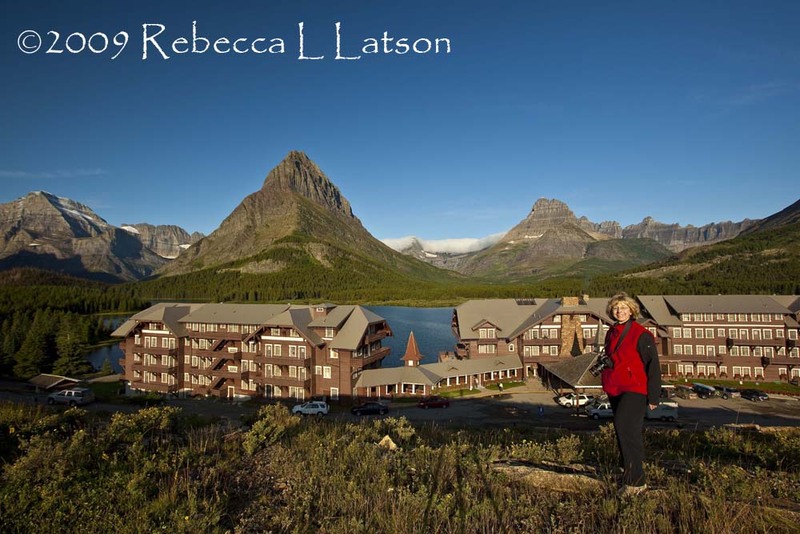 I generally ate breakfast and dinner at the lodge restaurants. 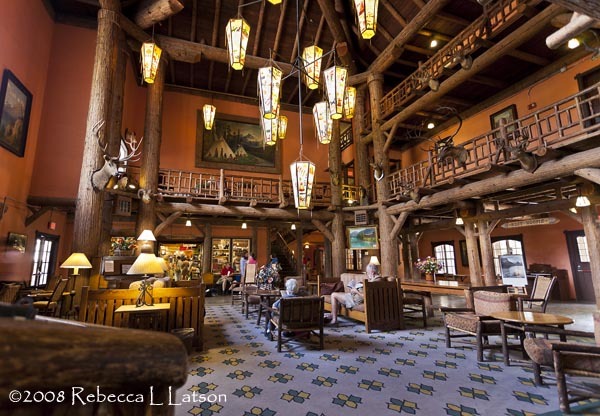 The Lake McDonald Lodge restaurant is pretty standard for park food (i.e. it’s nothing special, but generally OK although a little pricey – the local microbrews are great, though, and oftentimes these larger lodge restaurants also have a nice wine list). The dining room is large, lovely, and staffed by seasonal employees from all over the U.S. and the world. The waitstaff at all of these lodges are usually required to introduce themselves to the diners, who are always interested in finding out just how far the waiter/waitress travelled to work in the park. The next lodge en route along GTTS Road is the Rising Sun Motor Inn. GTTS Road bisects the park from West to East (or East to West, depending upon the entrance taken). 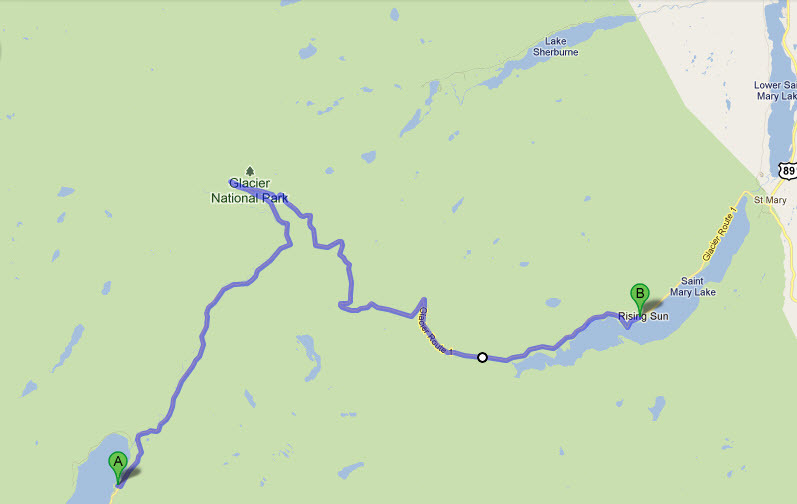 The entire distance from one end to the other is approximately 51 miles, with the midway point at Logan Pass. Rising Sun Motor Inn is about 33 miles from the Lake McDonald Lodge. The inn is a complex consisting of a hallway of rooms adjoining the General Store, a separate building housing the restaurant, and a number of cabins and buildings with motel-style rooms. 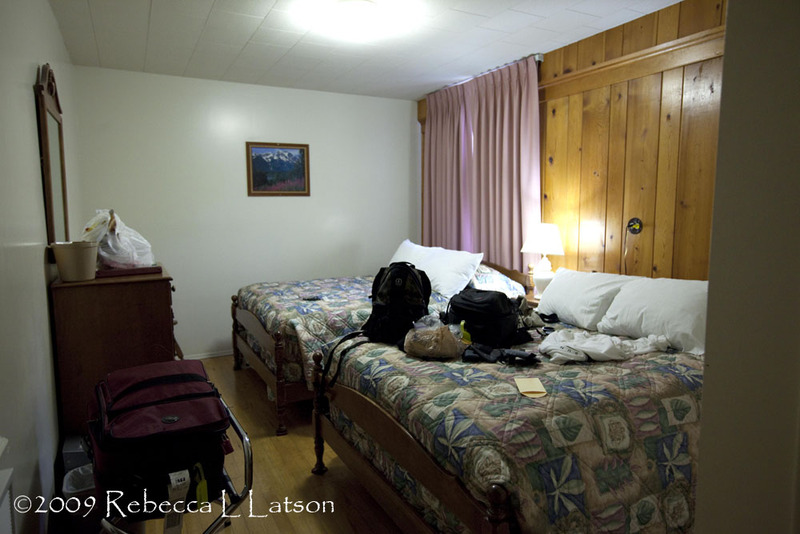 I stayed in a separate building with the motel-style rooms in 2008 during the photo workshop I attended in the park. In 2009, I stayed in a room adjoining the General Store. I naturally took no photos of my room in 2008, but had the foresight to do so in 2009. There’s a nice long front porch the length of the General Store and adjoining rooms. I remember sitting outside my first evening there in 2009 next to a table of four Germans, as the sky darkened from the rain/snow storm whipping through the mountains. After flying to Montana from hot, humid Houston during that late August, I luxuriated in the feel of the crisp cold air as we all drank our local microbrews. 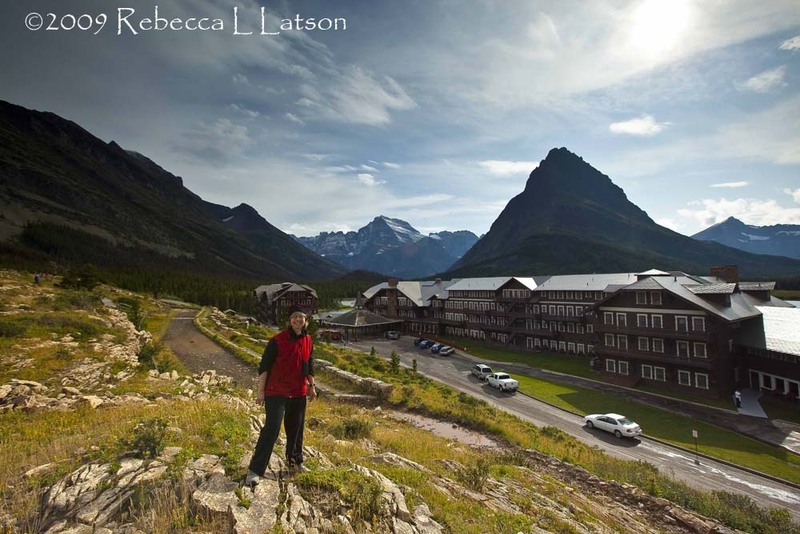 My very favorite lodge of all within Glacier National Park is the Many Glacier Hotel, approximately 25 miles from Rising Sun Motor Inn. 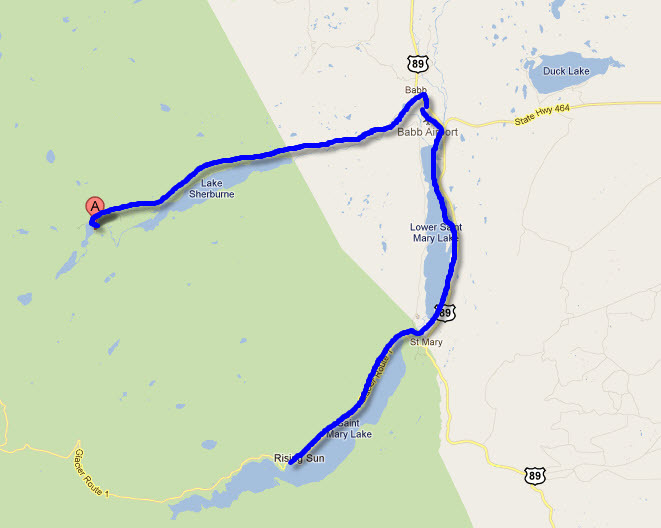 To get to the Many Glacier Hotel, you’ll actually leave GTTS road at the St. Mary entrance to the park boundary and travel north along Hwy 89. 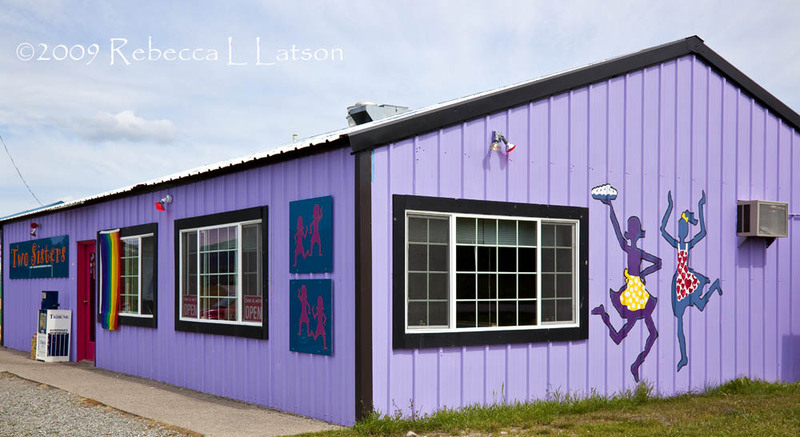 Before arriving in Babb, you’ll pass by a funky little purple building: the Two Sisters Cafe, serving some of the best food around – I’m even told they bake an awesome huckleberry pie. Unfortunately, every time I ate at the cafe, they had run out of that particular pie (huckleberry anything is a well-known delicacy of the region and I have wonderful memories of going huckleberry picking with my parents and Granny). Anything you order at Two Sisters Cafe will be tasty, and there will be plenty of it, so make sure you bring a hearty appetite. 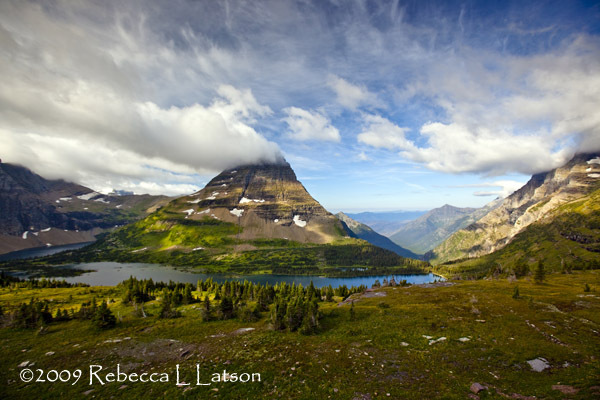 From Babb, you’ll take a left fork in the road to head into the Many Glacier portion of the park. Warning: drive slowly! Not only is the road on open range (the Blackfeet Reservation) with cows that like standing in the middle of the pavement and alongside the road, but the road itself is not the best-maintained and there are potholes and gravel portions that would wreak havoc with your vehicle, be it a bicycle, car, truck, van, or bus. It’s my favorite place to stay in the entire park. I love the architecture (modeled after Swiss chalets) and the location, which is – to me – the loveliest area of the park. This, of course, means I have alot of photos of this place. The rooms are essentially the same as at the other lodges within the park. I stayed at the hotel in both 2008 and 2009, and in 2009 I got a room with a balcony! 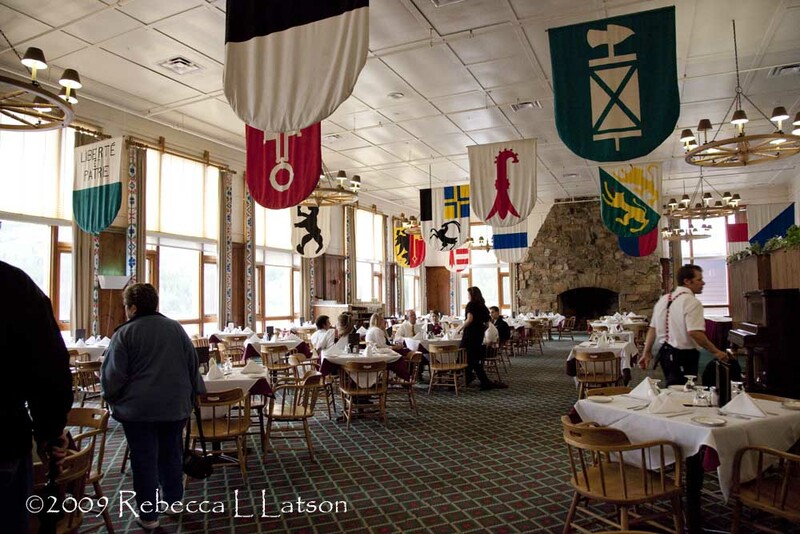 The main dining room (The Ptarmigan Room) overlooks Swiftcurrent Lake and the mountain vista beyond. 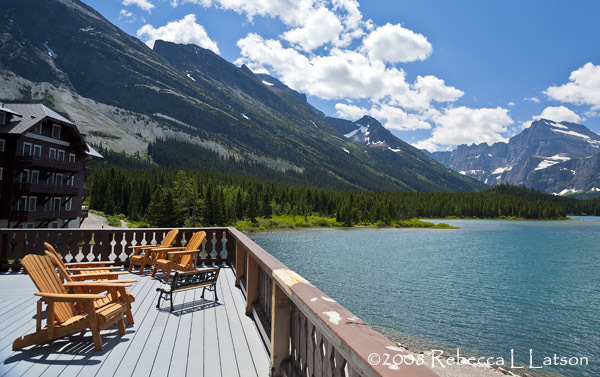 The deck at the rear of the hotel has plenty of chairs for guests to sit and sip their brew while viewing the mountain vista beyond Swiftcurrent Lake. A sunrise view from the shore of Swiftcurrent; the hotel was directly behind me when I captured this image. 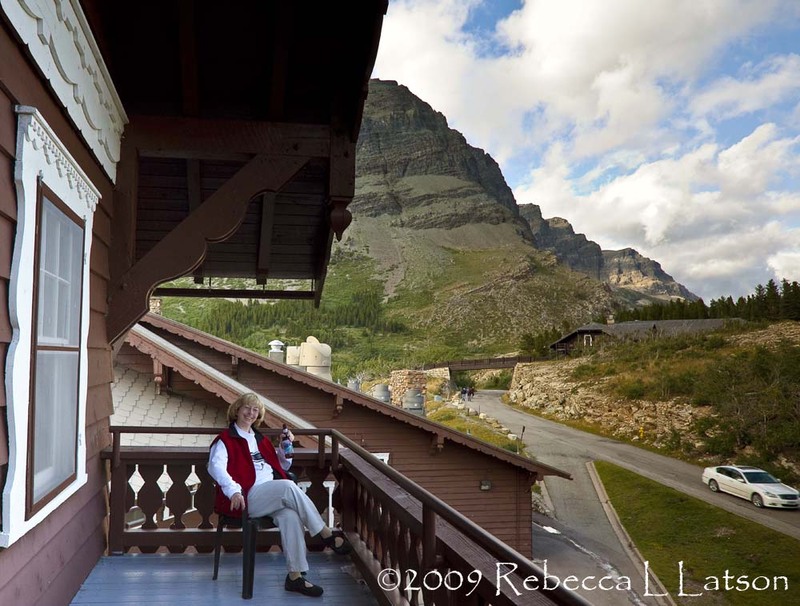 During the photo workshop in 2008, I stayed a night at Swiftcurrent Inn. http://visitmt.com/categories/moreinfo.asp?IDRRecordID=2482&siteid=1 which is maybe a mile or two up the road from the Many Glacier Hotel. There is also a huge campground alongside the road between the hotel and the Swiftcurrent Inn. As you can see from the website, there are cabins and buildings with motel-style rooms, which is where I lodged with the workshop for a night, after we had spent the previous night at the Many Glacier Hotel (we all wondered why on earth we couldn’t have just stayed at the hotel rather than have to pack up our stuff for yet another lodging for another night). 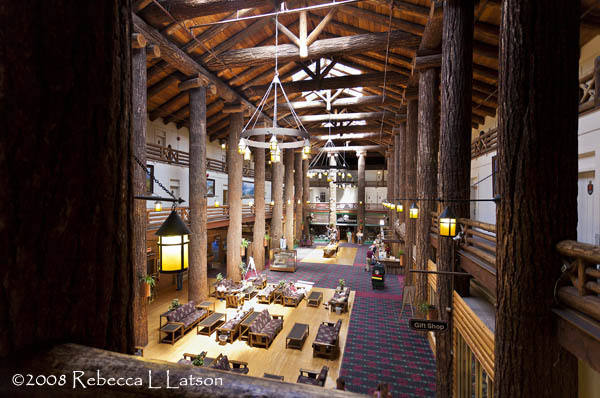 This lodge is impressive in its size and architecture. While none of my photos of the exterior turned out (I only took a couple, I think), the interior lobby photos look wonderful. My room was on the second floor, which is reached by staircase. I think they have an elevator, but it’s a service elevator which the porters use to transfer luggage to and from rooms. I don’t have much to say about my room. Of all the rooms in all the lodges at which I stayed, I must say the room at this lodge was a little on the dark, somewhat somber side. 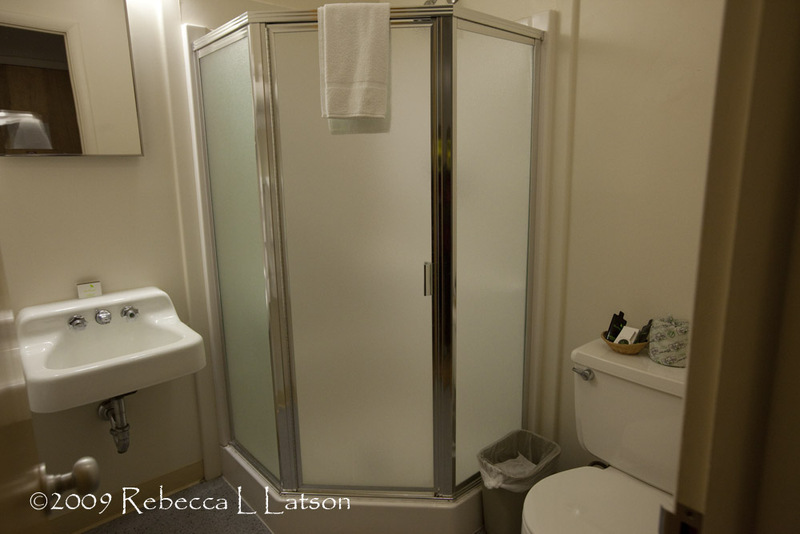 The bathroom was really nice – it was newly-remodeled with a huge shower. Plus, I got a room with a balcony (I’m a balcony-kind of gal), which afforded me a lovely view of the mountains beyond while I sipped my microbrew (by now, I am sure you know I like craft beers 😉 ). 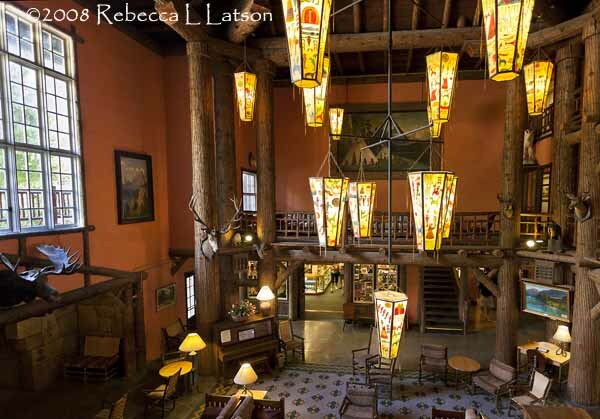 The Great Northern dining room is also a little more upscale than the other restaurants, with perhaps the exception of the Lake McDonald Lodge dining room. If you stay at the Glacier Park Hotel, make sure you order a huckleberry daiquiri with “extra huckleberry” (otherwise it will be a little on the bland side). The drink is not cheap, but it sure is tasty. If you choose to dine outside of the lodge, I highly recommend Serranos in East Glacier http://serranosmexican.com/ which serves awesome food at a great price and is always packed. 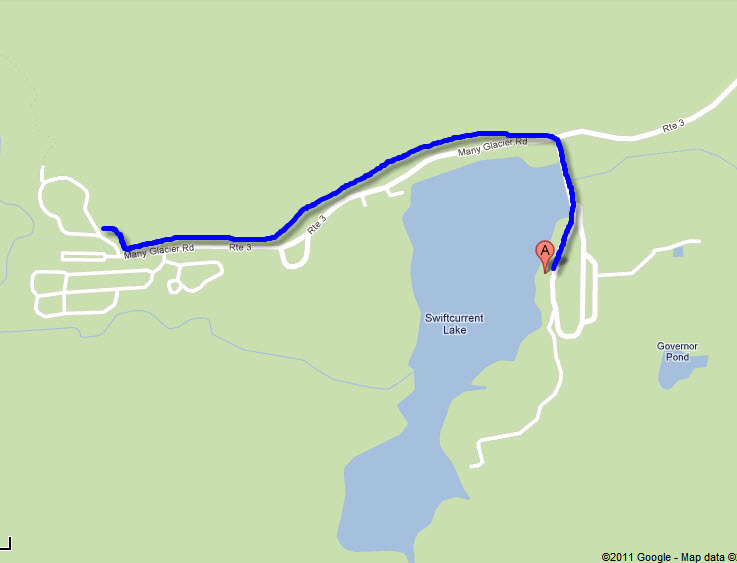 This place is a short drive or walk from the Amtrak train station, which is across the road from the lodge. If you decide to stay at any of these lodges within the park, I highly advise you make your reservations at least 6 months ahead of time. 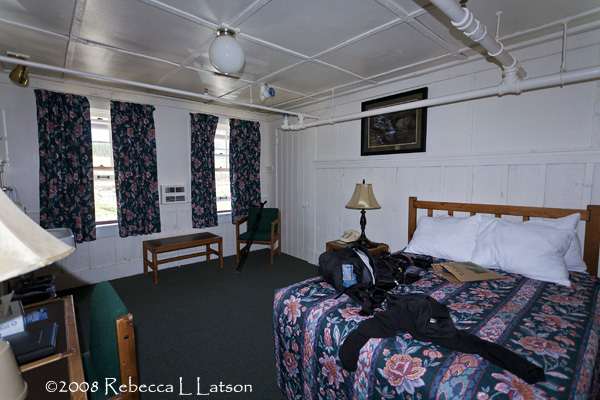 With so many visitors to the park each year, rooms are at a premium – even during the off-season. And don’t go with the high expectations of staying in a 5-star luxury hotel. The rooms in these lodges are clean, but on the rustic side, with simple furnishings, no televisions (who wants to watch TV when there is a whole park to explore?) 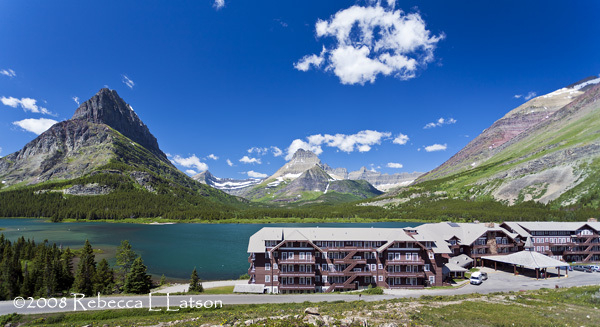 , no air conditioners, and no cell service (actually, my Verizon cell service worked just fine at Glacier Park Hotel, because it’s right on the outskirts of the mountains). Each of the lodges host various ranger-led programs and there is always a helpful staff member happy to answer any questions you may have about the park. The Red Jammers stop at each of the lodges, too, but for tour purposes and not for lugging you and your luggage from one lodge to the next. 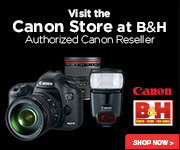 Check out the site link I’ve listed in this post for more information, if you are interested in a tour. 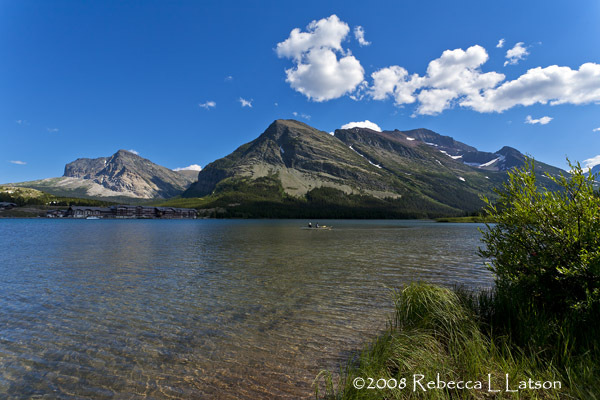 If you’ve never been to Glacier National Park in Montana, then I hope this post, the photos, and the links provided help you plan your trip to The Crown of The Continent.